Laser systems provided by Siegrist-Orel are high-performance lasers according to laser protective class 4. Their emitted laser radiation provides danger to its operator’s skin and eyes. In case, the laser system cannot be operated meeting the provisions of the laser protective class 1 by appropriate measures (e.g. application of a manual workplace), it will be mandatorily required to wear laser protective goggles. * Furthermore, Siegrist Orel offers laser protective glass in different sizes for do-it-yourself installation. 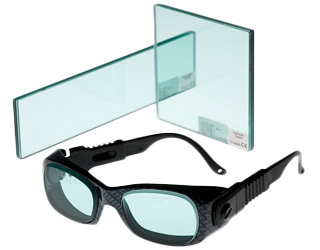 * For operating a laser according to laser protection class 4, further protective measures are required. Please obtain more information from Siegrist-Orel.